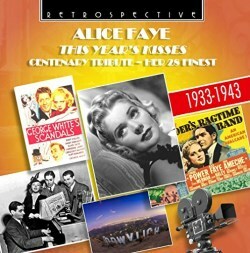 Cinema pin-up Alice Fay blazed comet-like for a decade and then deliberately retired from films in 1945 to spend more time with her family. She also took advantage of the more congenial environment offered by radio, working with Jack Benny and later her husband, Phil Harris. A resumption of her film career in the early 1960s led to disappointment. She was also not a really prolific recording star, so after 1936-37 the examples culled here come from soundtracks of her films – inevitably boxier than contemporary discs would have been. But what a natural, vivacious singer she was. Her easy charm survives the years undimmed right from her first entrance on Shame on You, recorded with Rudy Vallée and his Connecticut Yankees in New York in 1933. Her famous appearance in George White’s Scandals is represented in Nasty Man but even more engaging is her quick repartee and cross-talk in Here’s the Key to my Heart taken from the suggestively titled 1934 film She Learned About Sailors. Her show songs and light vaudeville numbers take her to the edge of her optimum range, both vocally and stylistically, but within her compass she does everything right. She sings This Year’s Kisses with an appealing ‘cello’ tone, in a way very dissimilar to Billie Holiday’s famous version. Here, and elsewhere she gets good backing from Cy Feuer and his Orchestra - unpretentious but apt. Despite the somewhat airless quality of the soundtracks they do preserve her ‘in situ’, in a succession of excellent films – not least Alexander’s Ragtime Band (1937) and Rose of Washington Square (1939). Her singing of You Turned the Tables on Me is a sheer delight and we can luxuriate in the glamorous sound of Alfred Newman’s orchestra in Now It Can Be Told. She’s joined by the Ink Spots – not quite as incongruous as it sounds – in Where You Are and joins Benny Goodman’s band for No Love, No Nothin’, a 20th Century soundtrack from The Gang’s All Here (1943). She was a popular singer in the best sense, with a voice rather deeper and more alto-like than her blonde looks might lead one to suppose. This well-annotated selection has been chosen very well.